You don't need to break the bank to own a 4G phone. Sprint unveiled its latest 4G phone, the Conquer 4G, which will cost $100 with a two-year contract after a $50 mail-in rebate. The Conquer doesn't have the latest and greatest specs, but this Android 2.3 phone (also known as "Gingerbread," the latest version of Android) has all the necessities of a solid smartphone. Powered by a 1GHz Snapdragon processor, the Conquer 4G has a 3.5-inch touch screen, a 3.2-megapixel camera, and a front-facing 1.3-megapixel camera for video chatting. It ships with a 2GB microSD card, but can handle up to 32GB of external memory. Like many of the mid-level Sprint Android devices, it comes with SprintID, a collection of mobile apps, wall papers and ringtones designed for personality types such as sports fans, fitness fanatics, or auto enthusiasts. For those who are new to the Android platform, SprintID is a useful tool for customizing your phone to meet your needs. Design-wise, the Conquer looks pretty unremarkable. It is a full touch device with your standard Android hardware buttons. It also seems to only come in one color: black. 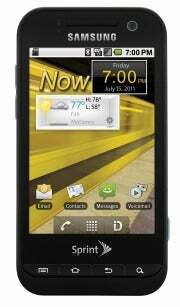 It is refreshing to see Sprint's dedication to offering wallet-friendly smartphones extend to its 4G network. But with the enticing (albeit more expensive) 4G phones on Sprint, like the Motorola Photon 4G and the HTC EVO 3D, you might feel a little tech envy if you get the Conquer 4G. Despite the 4G speeds, the specs seem a bit dated. But if you just want to use your phone for speedy Internet surfing and messaging, the Conquer will suffice. Stay tuned for a full review once we get a Conquer 4G in house.